If nothing else, you should take that from this review. Take it all the way to iTunes or your local record store (or wherever else you satiate your musical thirst) and acquire this music. Then share it with someone special. ‘Research’ is the creation of Melbourne musician, Simon Gibbs, who was previously a member of Tic Toc Tokyo. It also features musicians Daphne Shum, of Rat vs Possum, and Nicolaas Oogies, of No Zu. This is music for the joy of music. Music that’s not fit to any particular genre; it’s an exploration of what creativity is capable of. In particular, it is a percussionist’s delight – the emphatic use of percussion provides the album with an almost tribal feel. This is partnered perfectly, if unexpectedly, with hymnal vocals (think Fleet Foxes). The blend of fluid, earthly elements, with modernistic technological production, creates a sense of wonder at where one ends and the other begins. 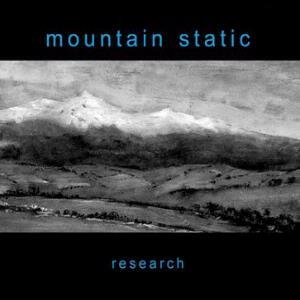 It is interesting to note that parts of Research were actually recorded in a couple of Melbourne churches – indeed, some of Mountain Static’s upcoming tour will be staged in churches to reproduce the album’s distinct acoustics. Listening to a cappella ‘The End of the Golden Weather’, you can imagine how chillingly powerful its performance would be with the high ceilings and stone walls of a church to magnify and echo Gibbs’ clear voice. But wait, this description so far is not complete. If you thought you knew where the record was going – and one could be forgiven for thinking such a thing – come track five (‘Migrations Part 1’), a perfect new wave/shoe-gaze offering, you will realise the error of your presumption. Part 2, an instrumental featuring bird calls, goes in yet another direction. Both ‘Migrations’ tracks provide what their names suggest: an interlude. They effectively prevent the possibility of the majesty of the first half of the album becoming stale by the second (which is, fittingly, lead into with the track ‘Returning Song’). Research does not fit into the conventional mold. At best, it will become a cult classic. But then, as has been the case throughout history, much of the great art we now value only comes to be fully appreciated in time – often after the artist is long dead and buried. Let’s hope it doesn’t take that long for Mountain Static. This entry was posted in Music and tagged mountain static, research, simon gibbs. Bookmark the permalink.